Powered by Apostle MiniMax technology, Apostle MiniMaxTM High Efficiency cfDNA Isolation Kit is an excellent tool for the isolation of ultra-low concentration cell free DNA (cfDNA). Compared to major alternative suppliers, Apostle MiniMax TM High Efficiency cfDNA Isolation Kit offers superior DNA isolation efficiency for DNA ladders spiked in different biological medium (Exhibit 1). Exhibit 1. Superior DNA isolation efficiency. 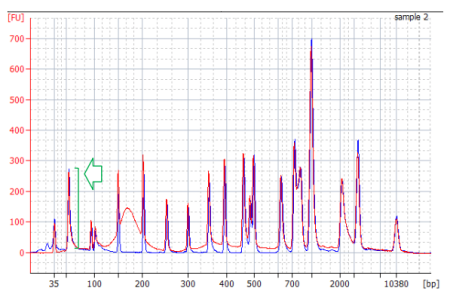 A) DNA ladder (50-3000bp) was spiked in TE buffer, followed by isolation with Apostle MiniMaxTM High Efficiency cfDNA Isolation Kit (red curve) and major alternative product (blue curve). The isolated DNA was characterized by Bioanalyzer 2100. B) DNA ladder was spiked in serum, followed by isolation with Apostle MiniMaxTM High Efficiency cfDNA Isolation Kit (red curve) and major alternative product (blue curve). The isolated DNA was characterized by Bioanalyzer 2100. Apostle MiniMaxTM High Efficiency cfDNA Isolation Kit offers superior DNA enrichment efficiency of 110% – 10x. 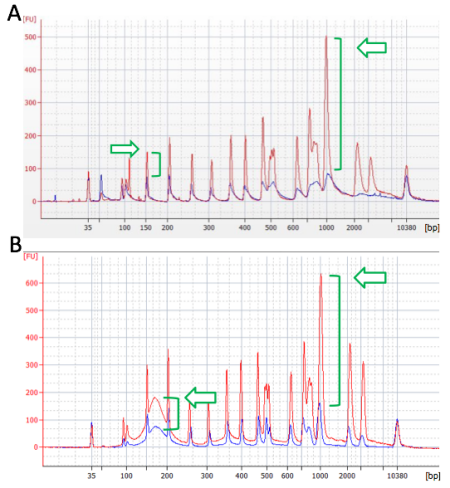 Over 95% DNA recovery in range between 80–3000 bp was achieved using Apostle MiniMaxTM High Efficiency cfDNA Isolation Kit, as demonstrated through recovery of DNA ladder spiked in serum (Exhibit 2). This is due to the optimal interaction between DNA and the nanoparticles enabled by the MiniMax technology, resulting in efficient binding with cfDNA in complexed biological medium and total elution of cfDNA at later stage. Exhibit 2. Over 95% DNA recovery in range between 80–3000 bp. 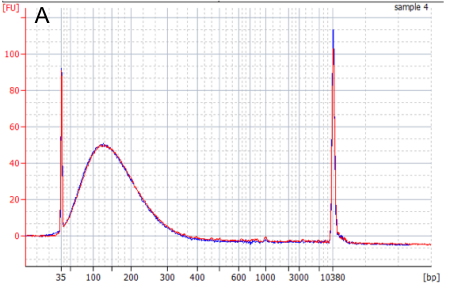 DNA ladder was spiked in serum, followed by isolation with Apostle MiniMaxTM High Efficiency cfDNA Isolation Kit. The Isolated DNA was characterized by Bioanalyzer 2100 (red curve), and compared with original DNA ladder (blue curve). Apostle MiniMaxTM High Efficiency cfDNA Isolation Kit offers superior DNA recovery efficiency of >95%. 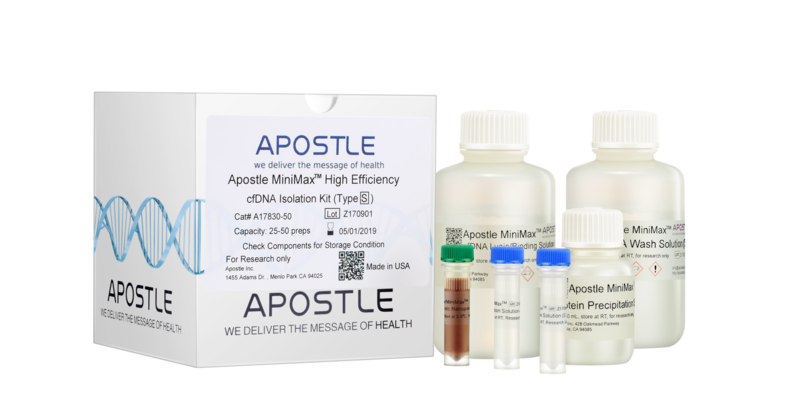 The Apostle MiniMaxTM High Efficiency cfDNA Isolation Kits are manufactured under highly controlled and validated production processes. This will ensure optimal performance with high efficiency and reproducibility in cfDNA isolation ( Exhibit 3). Exhibit 3. Highly reproducible DNA isolation process. DNA ladder was spiked in serum, followed by isolation with three batches of Apostle MiniMaxTM High Efficiency cfDNA Isolation Kit. The Isolated DNA was characterized by Bioanalyzer 2100, and compared between batches. Apostle MiniMax TM High Efficiency cfDNA Isolation Kit offers highly consistent DNA isolation result. cfDNA is a group of highly fragmented DNA molecules, with major peak at ~170bp, doublet peak at ~340bp, triplet peak at ~510bp, and so on. Therefore, cfDNA isolation kit capable of highly efficient cfDNA isolation spanning wide cfDNA size distribution is desired. Apostle MiniMaxTM High Efficiency cfDNA Isolation Kit meets such need as demonstrated from its >95% recovery of DNA ladder. 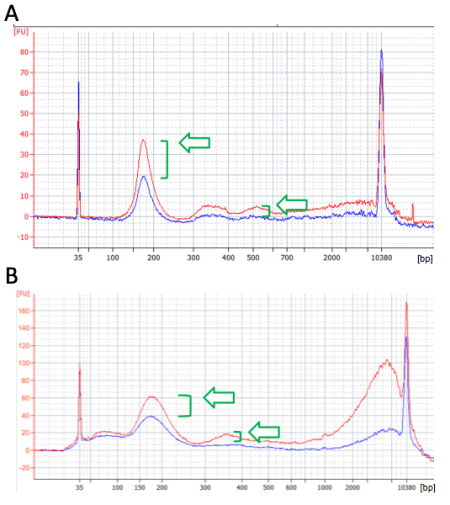 This is further validated through isolation of natural cfDNA from human plasma (Exhibit 2.4A) and urine samples (Exhibit 4B), where Apostle MiniMaxTM High Efficiency cfDNA Isolation Kit offers superior cfDNA isolation efficiency over wide range, specifically covering the 170bp, 340bp, and 510bp cfDNA peaks, when compared with major alternative product. Exhibit 4. Superior natural cfDNA isolation efficiency in human plasma and urine. A) Cell-free plasma was separated from blood samples by centrifugation for 10 minutes at 2000g at 4oC, then centrifuged for 10 minutes at 16000g at 4oC. cfDNA was isolated from 4mL plasma with Apostle MiniMaxTM High Efficiency cfDNA Isolation Kit (red curve) and major alternative product (blue curve). The isolated cfDNA was characterized by Bioanalyzer 2100. B) Cell-free urine was prepared by centrifugation for 10 minutes at 16000g at 4oC. cfDNA was isolated from 20mL urine with Apostle MiniMaxTM High Efficiency cfDNA Isolation Kit (red curve) and major alternative product (blue curve). The isolated cfDNA was characterized by Bioanalyzer 2100. Apostle MiniMaxTM High Efficiency cfDNA Isolation Kit offers superior cfDNA isolation efficiency for both plasma and urine samples. Apostle MiniMaxTM High Efficiency Cell-Free DNA Isolation Kit enables superior and consistent performance of DNA mutation detection, validated by qPCR (Exhibit 5). 20 uL of DNA fragment containing the EGFR c.2573T>G L858R mutation (synthetic, ~170 bp), with concentration of 1 ng/uL, 0.1 ng/uL, 0.01 ng/uL, 0.001 ng/uL, was spiked into 1mL TE buffer (blue) or Serum (red) respectively. The mutated DNA fragment was isolated with Apostle MiniMax TM High Efficiency Cell-Free DNA Isolation Kit (Standard Edition), with a final elution volume of 20 uL. 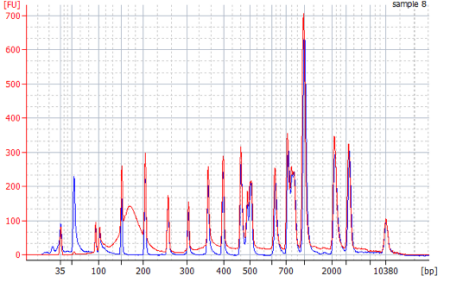 qPCR was performed using 1 uL of the isolated DNA, and compared with 1 uL of the corresponding original mutated DNA solution at 1 ng/uL, 0.1 ng/uL, 0.01 ng/uL, 0.001 ng/uL. 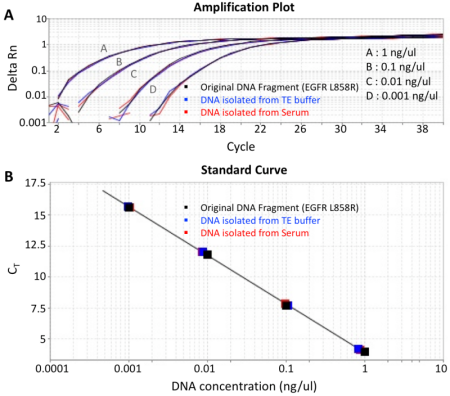 A) Amplification plot showing highly overlapping curves for mutated DNA fragment isolated with Apostle MiniMaxTM High Efficiency Cell-Free DNA Isolation Kit and original DNA solution at different concentrations. B) qPCR standard curve generated using original mutated DNA solution, in order to quantify the recovery of DNA isolated with Apostle MiniMaxTM High Efficiency Cell-Free DNA Isolation Kit. DNA isolation recovery rate was calculated to be >90%. Note: Displayed DNA concentration series at 1, 0.1, 0.01, 0.001 ng/ul are the concentrations of the original DNA dilution series before spiking into 1mL of serum. 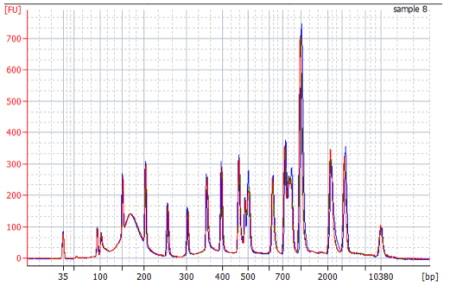 The corresponding DNA isolation working concentrations are 20 pg/ul, 2 pg/ul, 0.2 pg/ul, 0.02 pg/ul, respectively. Powered by Apostle MiniMax technology, Apostle MiniMaxTM High Efficiency cfDNA Isolation Kit (Type S) is an excellent tool for the isolation of ultra-low concentration cell free DNA (cfDNA). Apostle MiniMaxTM High Efficiency cfDNA Isolation Kit (Type S) is featured for its efficient recovery of small DNA fragments ( <100 bp) from biological samples, where major alternative products fail (Exhibit 6 & 7). This feature is quite useful when small DNA molecules have significant presence in the biological sample and need to be isolated ( Exhibit 6). Exhibit 6. Over 95% DNA recovery in range between 50–3000 bp. DNA ladder was spiked in serum, followed by isolation with Apostle MiniMaxTM High Efficiency cfDNA Isolation Kit (Type S). The Isolated DNA was characterized by Bioanalyzer 2100 (red curve), and compared with original DNA ladder (blue curve). Apostle MiniMaxTM High Efficiency cfDNA Isolation Kit offers superior DNA recovery efficiency of >95%, including small DNA fragments at ～50 bp as highlighted. Compared to major alternative suppliers with magnetic bead technology, Apostle MiniMaxTM High Efficiency cfDNA Isolation Kit (Type S) offers superior DNA isolation efficiency for cfDNA reference spiked in biological medium, especially for cfDNA with size <80 bp (Exhibit 7). Exhibit 7A. Superior small DNA isolation efficiency. A) cfDNA reference standard (Horizon Discovery Ltd, Cat# HD780) was spiked in TE buffer, followed by isolation with Apostle MiniMaxTM High Efficiency cfDNA Isolation Kit (Type S). The isolated DNA was characterized by Bioanalyzer 2100 (red curve), and compared with original cfDNA reference standard (blue curve). 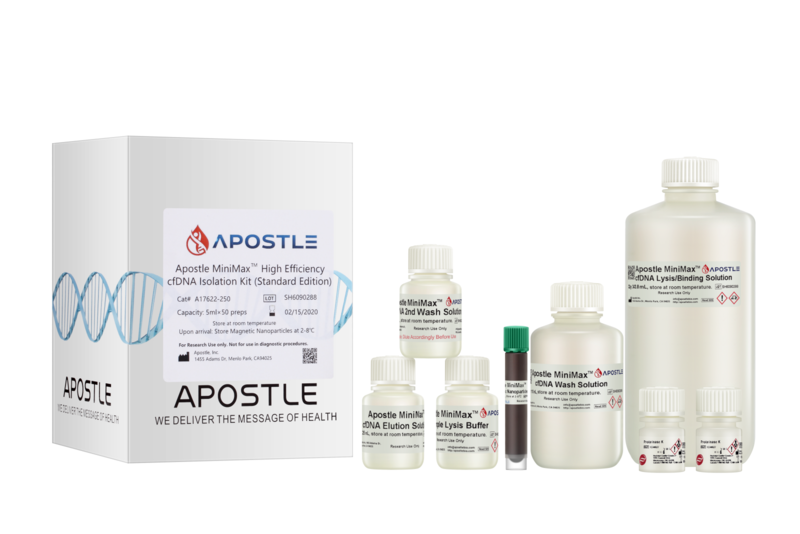 Apostle MiniMaxTM High Efficiency cfDNA Isolation Kit (Type S) offers >95% recovery of the cfDNA reference standard, which has significant portion of DNA fragments with size <100 bp. Exhibit 7B. Superior small DNA isolation efficiency. B) cfDNA reference standard was spiked in TE buffer, followed by isolation with MiniMaxTM Type S and a major alternative product. 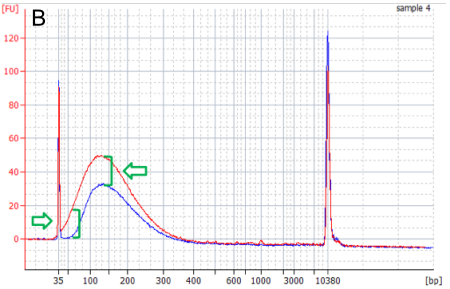 Bioanalyzer 2100 analysis demonstrated significantly higher cfDNA recovery rate of MiniMax TM Type S (red curve) compared to a major alternative product (blue curve). Exhibit 7C. Superior small DNA isolation efficiency. C) Zoom in of B）in the region between 35–100 bp. 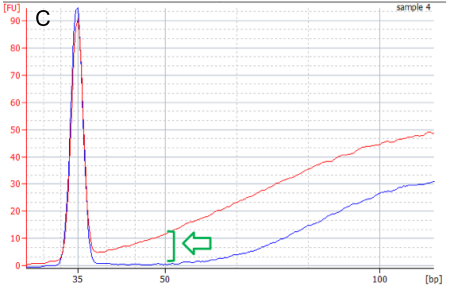 MiniMaxTM Type S (red curve) is compared to a major alternative product (blue curve). Bioanalyzer 2100 analysis demonstrated the efficient recovery at ~50 bp of MiniMaxTM Type S (red curve), while a major alternative product (blue curve) failed.